BJP won 122 seats out of 288 of Maharashtra assembly election. 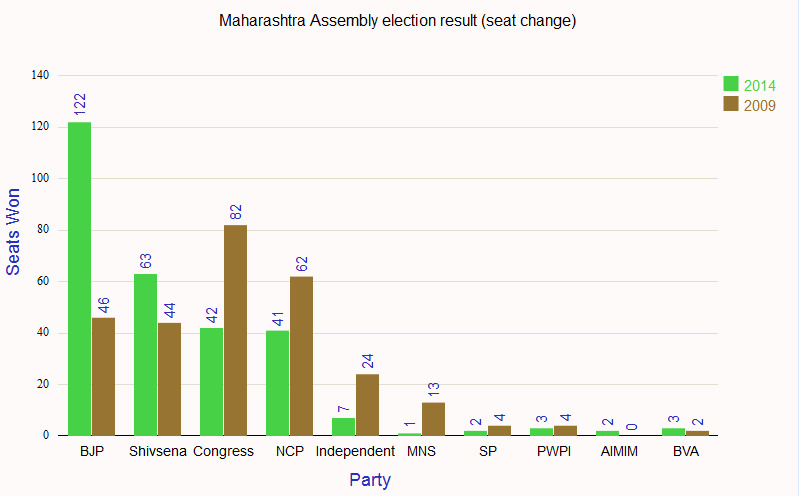 Shivsena is the second-largest party with 63 seats. Congress, which was largest party in previous election is now at third place with 42 seats. NCP won 41 seats. BJP gains 76 seats compare to 2009 election. Shivsena gain 19 seats. Congress lost 40 seats and NCP lost 21 seat. BJP got 27.8% of total vote, 13.8% higher than 2009. Shivsena also got 3.0% higher than 2009. MNS has won only one seat. In 2009, party has won 13 seats. 0.9% voter has voted for NOTA.